If you came across a wild baby animal that appeared to be orphaned and helpless, would you know what to do? How to help an injured hawk or owl, raccoon, opossum, rabbit or squirrel? A licensed wildlife rehabilitator is your solution. 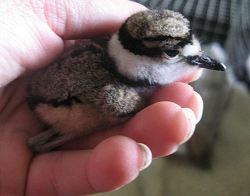 A wildlife rehabilitator is a person licensed by the state to take in orphaned and injured wildlife. They receive calls from people who came across a wild critter that appeared to be in need of human intervention.Animals are also brought to rehabilitators by local animal control agencies, game wardens, police departments, sheriff offices, veterinary clinics and animal shelters. Every day wild animals suffer conflicts and trauma, such as a baby squirrel that was displaced by landscapers; an opossum mother hit by a car with living babies in the pouch that caring individuals saved; the litter of cottontail rabbits whose mother fell victim to a lawn mower; the adult raccoon that was raised as a pet and became too much to handle; or a wild animal hurt by our dogs and cats. In the case of infant critters where a reunion with the mother has been ruled out, orphans will be raised and taught how to relate to others of their species, given a chance to learn critical survival skills, know what their predators are, and how to find food and shelter before they will be released back into the wild where they belong. Once spring approaches the phone rings endlessly, often starting with reports of pink hairless babies found on the ground. There are a lot of caring folks out there that assist in transporting the animals to the rehabilitator. Unfortunately a lot of people initially attempt to care for these animals on their own and only seek a wildlife rehabilitator when they see that their methods are not working. Sadly, at that point it is often too late to help. Many folks don’t know that it is illegal in Texas to take an animal out of the wild and attempt to treat it on their own without the proper permits, no matter how kind and caring their motives. These regulations apply to squirrels, opossums, raccoons, skunks, foxes, songbirds, birds of prey, fawns, to name just a few. Even if the kindhearted Samaritan intends to release the animal back into the wild, it's most likely not going to happen if they don't know what they are doing. In addition they could expose themselves, their family, friends, and pets to potential diseases, parasites and injuries. Working with wild animals is very different from working with pets. Where it's ok to hold an orphaned kitten or puppy to comfort it, handling can be fatal to a cottontail rabbit or baby bird for example, because they can die of fear in an instant. Keeping all handling and human exposure to a minimum is also vital for the animals' survival in the wild later on. Most wildlife rehabilitators are home based and their first priority must be the animals presently in their care. They often can’t respond to every emergency call in person, but are happy to give advice and provide detailed instructions to caring individuals based on the situation and animal involved. Wildlife rehabilitation does not receive government funding and must rely on donations from the public. Rehabilitators cannot charge for their services. The government requires wildlife rehabilitators to be trained before obtaining the necessary permits, provide proper facilities which are subject to inspection, provide release sites, pay for all animal food and medical care and even for their own pre-exposure rabies shots. Some rehabilitators establish a wildlife center in their area, usually not-for-profit due to the lack of funding and need for donations. That's why there are not many independent wildlife facilities in America. Some of the more fortunate rescues are connected to colleges or vet clinics and play a vital part in education and research. Home based rehabilitators must therefore find the time to arrange fundraisers all year long to assist with ongoing expenses. Wildlife rehabilitators are dedicated warriors on the front lines between suburban development and natural habitat and are grateful for every bit of support. Try to re-unite the baby with its mother by placing the squirrel in a basket and placing it in the nearest tree. If babies are chilled fill a water bottle with warm water and wrap it in an old shirt. Place bottle with babies but make sure it can’t roll onto them. If reunion is impossible, place the infant squirrels in a safe place and provide warmth. Do not feed them, especially not cow’s milk. It will most likely kill them. 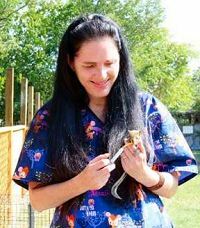 The Rainbow Wildlife Rescue, a 501(c)3 nonprofit organization was founded in 2004 in Stephenville by Birgit Sommer, a licensed Texas wildlife rehabilitator.. Driven by the compassion for all God’s creatures and on the mission to further the understanding between humans and wildlife, the Rainbow Wildlife Rescue opens its doors not only to animals in need of care but also takes an active part in educating the public. Current plans under development include project “Wildlife in the Classroom” supported by local teachers.